As cities are being replanned and redeveloped, urban farming is becoming a large, functional and sustainable part of those new plans. 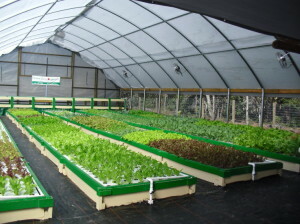 Part of that food production is aquaponics which is being used to grow healthy, natural food as discussed in Aquaponics Tomatoes and Aquaponics as a Sustainable Food Alternative. It is a cycle based on plants, fish and fertilizer that creates a growing, greenhouse ecosystem. The system uses only 10 percent of traditional landscaping water amounts. Aquaponics is being used in Denver’s Elyria-Swansea’s neighborhood in the non-profit urban indoor farm and market of The GrowHaus. The area it is designed in is called the ‘food desert’ because of its lack of grocery stores or places to get fresh ingredients. They offer growing and cooking classes to the community and to kids so that they get the full experience of growing, harvesting and cooking healthy, sustainable food. They also offer ongoing service learning, educational classes and 3-month internships to continue the growth of the community. The GrowHaus is a great community plan that encourages smart sustainable growth and involvement. It is one small stepping stone in the right direction of new and much needed urban re-developmental plans with the use of new technological sustainable systems such as aquaponics.